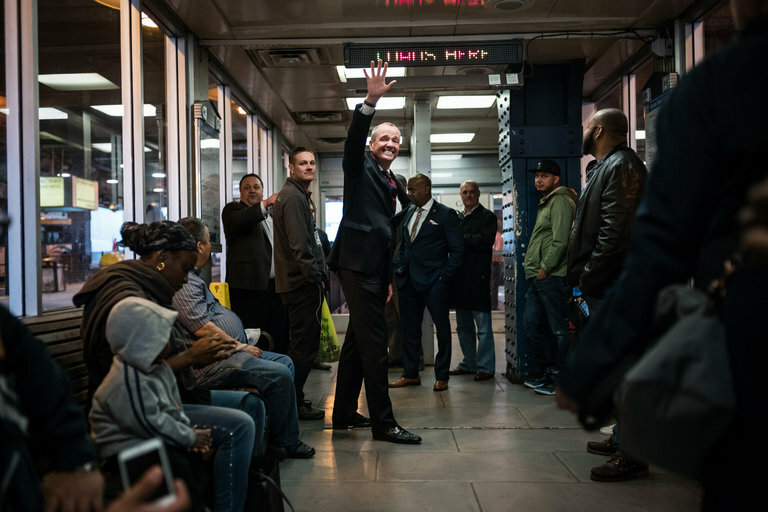 Philip D. Murphy, the Democratic candidate for New Jersey governor, campaigning outside Pennsylvania Station in Newark. Sheila McPherson is listed as a homemaker on an Internal Revenue Service report from the Democratic Governors Association. This year, Ms. McPherson donated $80,000 to the association, the first time, records show, that she gave to the national group. She also sent $10,000 to the New Jersey Democratic Committee. Mrs. McPherson, who lists her residence in Rutherford, N.J., is married to Kenneth McPherson, a lawyer at a powerful firm, Waters, McPherson, McNeill. Had her donations gone directly to Philip D. Murphy, the Democratic candidate for governor in New Jersey, it would have prevented her husband’s firm from getting any state contracts under a potential Murphy administration, the result of New Jersey’s strict pay-to-play laws. She also would have been able to give only $4,300 to Mr. Murphy directly. Had she donated to any of the officials in counties where her husband’s firm has contracts, which total about $630,000, according to the New Jersey Election Law Enforcement Commission, they too would have come under scrutiny for potential pay-to-play violations. In a brief phone interview, Ms. McPherson confirmed she made the donations and that she is an “anti-Christie” voter, but declined to comment further. Sending the money to the governors association is legal. And with just two statewide elections this year, the national group can use that money to support Mr. Murphy in New Jersey. As the race to replace Gov. Chris Christie enters the homestretch, donations from New Jersey residents and companies in the state have poured in to the Democratic Governors Association coffers, totaling more than $1.6 million as of August, an increase of more than $1 million compared with the total amounts in elections for governor in 2009 and 2013. The donations have come largely from a mix of pharmaceutical companies, unions, construction companies, law firms and corporations that would have been barred from obtaining government contracts if they had donated directly to Mr. Murphy or local candidates. “When we wrote the pay-to-play law, we tried imagining everything that we can as to how people are going to get around it,” said Craig Holman, a former senior researcher for the Brennan Center for Justice in New York who helped draft the law in New Jersey in 2004. “But we knew there would be things we didn’t think of, and the R.G.A. and D.G.A. is one such example.” R.G.A. refers to the Republican Governors Association. The process of directing money to candidates in New Jersey through the national groups has been a practice since the state’s pay-to-play law was expanded and toughened in 2004. During Mr. Christie’s re-election bid in 2013, the Republican Governors Association received about $700,000 from construction companies, engineering firms, utilities and casinos, including some that had received state contracts for the recovery effort after Hurricane Sandy. This year, the same group has raised about $787,000 from New Jersey, including about $80,000 from companies with state contracts. But the increase in donations to the Democratic Governors Association this year takes on added significance after Mr. Murphy announced that he would participate in the state’s public financing program for the general election. In the primary, Mr. Murphy spent more than $20 million of his own money to fend off challenges from Jim Johnson, John Wisniewski and Raymond Lesniak. Now, he will not be able to tap his personal wealth to support his candidacy and instead will be limited to spending $13.8 million in the general election. Mr. Murphy enjoys a significant fund-raising advantage over his Republican opponent, Lt. Gov. Kim Guadagno, having raised roughly $4 million so far compared with about $1.5 million for Ms. Guadagno. Yet he will rely increasingly on groups like the Democratic Governors Association and a political action group, the Committee to Build the Economy. In fact, Mr. Murphy is planning to attend a governors association fund-raiser with George Norcross, a South Jersey political power broker. The invitation tells guests that the group can accept unlimited amounts from donors. The Democratic Governors Association is not limited to simply supporting Mr. Murphy; it can use the money however it wants, within federal guidelines, and that includes sending money to county political parties. This year, the group has sent more than $415,000 to county parties in New Jersey, sending the maximum amount of $37,000 each to 10 counties. One New Jersey union, the Operating Engineers Local 825 PAC, which represents heavy equipment operators, mechanics and surveyors, made a $300,000 donation this year to the Democratic Governor’s Association, its first to the group and the largest single contribution from New Jersey. “We wanted to make a statement on how important control of the statehouses is to us,” said Greg Lalevee, a business manager at the union. As an example of why donating to the association was crucial, he noted that in Kentucky, after legislative control switched from Democrats to Republicans, lawmakers tried to limit the power of unions. Some global companies based in New Jersey, including Johnson and Johnson, AT&T, Novartis and Merck, often give similar amounts every year to both the Democratic Governors Association and the Republican Governors Association, a political investment intended to ensure access to events held by both groups. But the prospect of victory by Mr. Murphy, who leads Ms. Guadagno by nearly 20 points in many polls, has attracted new donors to the Democratic organization. A hotel group known as Jersey City Hospitality donated $37,500 this year, the first time it has appeared on the donor rolls of the Democratic Governors Association. G.R. Robert Construction Company, another first-time donor, contributed $27,500. Mount Construction Company gave multiple donations this year totaling $52,943. Jeff Brindle, the executive director of the Election Law Enforcement Commission, said the one restriction on national donations from New Jersey is that businesses are not allowed to form political nonprofits to circumvent the state’s pay-to-play laws. But the practice has led many critics to argue that it is an easy way for contractors seeking favorable treatment to funnel money to candidates.